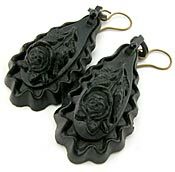 A rare and fashionable pair of Victorian earrings created from black vulcanite. 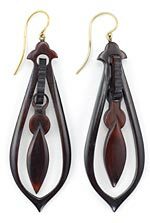 This is a very large pair of tear drop shaped earrings featuring an upside down rose complete with stem and leaves. The backs of the earrings are covered with a molded pattern. Extremely Fine condition with no damage or repairs. The earwires appear to be original. Item # 10601 Price: $375 USD Tell me more! Sparkling pink Deco. A large oval faceted pink crystal hangs from each of these silver Art Deco era earrings. Three marcasites accent the upper portion of the earrings. Screw backs. Item # 10491 Price: SOLD $225 USD Tell me more! Authentic and rare Victorian earrings. Dangle style earrings for pierced ears. The backs are posts with nuts that screw on. Once you get them on you won't lose them. Gold filled. Circa: 1890-1915. Item #10341 Price: $125 USD Tell me more! A perfectly enchanting pair of sparkling amethyst glass drop earrings from the Victorian era. Absolutely no chips or scratches to the glass! The earwires are gold over brass. Item # 10436 Price: $275 USD Tell me more! An ornately festive pair of gilded brass Edwardian period earrings. Beautifully detailed with gold filigree and leaves. Accented with multi-colored rhinestones. Screwback earrings became popular in 1909. Item # 10443 Price: SOLD $95 USD Tell me more! Very Deco. Created from rhodium plated sterling silver, faceted black onyx and sparkling marcasites. Perfect condition!! Screwback. Item #10442 Price: SOLD $175 USD Tell me more! Sparkling crystals. These brass and faceted lead glass crystal earrings are a most delightful peachy pink and sparkle brightly. A foil backed rhinestone is prong set at the top of the earring. Screwback earrings became popular in 1909. Item #10455 Price: SOLD $120 USD Tell me more! Vintage Weiss earrings that sparkle with rhinestones. Created from ivory colored plastic that has been set with marquise cut rhinestones in shades of sapphire, peridot, rose, and amber. Between the larger rhinestones, smaller clear rhinestones have been sprinkled. Hallmarked, WEISS, on the back of each earring. Item # 10721 Price: SOLD $45 USDTell me more! Sparkling with inner fire. A beautiful pair of antique Victorian earrings comprised of dozens of ruby red, rose cut Bohemian garnets prong set in brass. Jewely set with Bohemian garnets was very popular in the 19th century. This pair of earrings is in Extremely Fine condition with no damage or repairs. Not hallmarked. Item #10661 Price: SOLD $375 USD Tell me more! The height of Victorian fashion. A beautifully designed and crafted pair of drop earrings. These appear to have been created from an early plastic, possibly casein. Casein could be crafted to resemble tortoise shell. The color is a dark, slightly translucent brown. Very lightweight.Extremely Fine condition with no damage or repairs. Not hallmarked. The earwires appear to be original. Item #10842 Price: SOLD $100 USD Tell me more!